Thom Hartmann, the most popular progressive radio host in America and a New York Times bestselling author, looks at the real history of guns in America and what we can do to limit both their lethal impact and the power of the gun lobby. Taking his typically in-depth, historically informed view, Thom Hartmann examines the brutal role guns have played in American history, from the genocide of the Native Americans to the enforcement of slavery (Slave Patrols are in fact the Second Amendment's "well-regulated militias") and the racist post-Civil War social order. He shows how the NRA and conservative Supreme Court justices used specious logic to invent a virtually unlimited individual right to own guns, which has enabled the ever-growing number of mass shootings in the United States. But Hartmann also identifies a handful of powerful, commonsense solutions that would break the power of the gun lobby and restore the understanding of the Second Amendment that the Framers of the Constitution intended. This is the kind of brief, brilliant analysis for which Hartmann is justly renowned. Thom Hartmann is a progressive national and internationally syndicated talk show host. Talkers Magazine named him America's #1 most important progressive host and the host of one of the top 10 talk radio shows in the country every year for over a decade. A four-time recipient of the Project Censored Award, Hartmann is also a New York Times bestselling author of twenty-four books, translated in multiple languages. “It’s no surprise to anyone that Thom Hartmann is a prolific, brilliant, bestselling author and talk radio host. What is a surprise is when the man meets the moment so perfectly. That happens in his new book, The Hidden History of Guns and the Second Amendment. “This profoundly personal yet typically insightful historical work so wonderfully encapsulates the pulse of our time and the sea change the Parkland kids and others have made in our national, and deadly, struggle with guns in America. "Thom is the professor America needs. If people knew what he knows, we'd have a vastly different country. 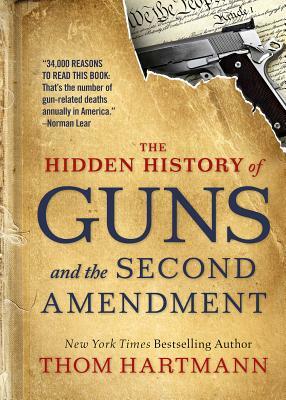 If you want to know anything and everything about the issue of guns in America, you have to read this book."